We have a listener contribution for the show, but before I can give it to you, I have to tell you a story to set it up. As you most certainly recall, I did a nuke and pave of my MacBook Pro a few weeks ago for my installation of Mojave. I checked all of my mission-critical apps before this endeavor. One high priority app for me is the cloud backup service Backblaze. Backup tools under Mojave need to be given special permissions. 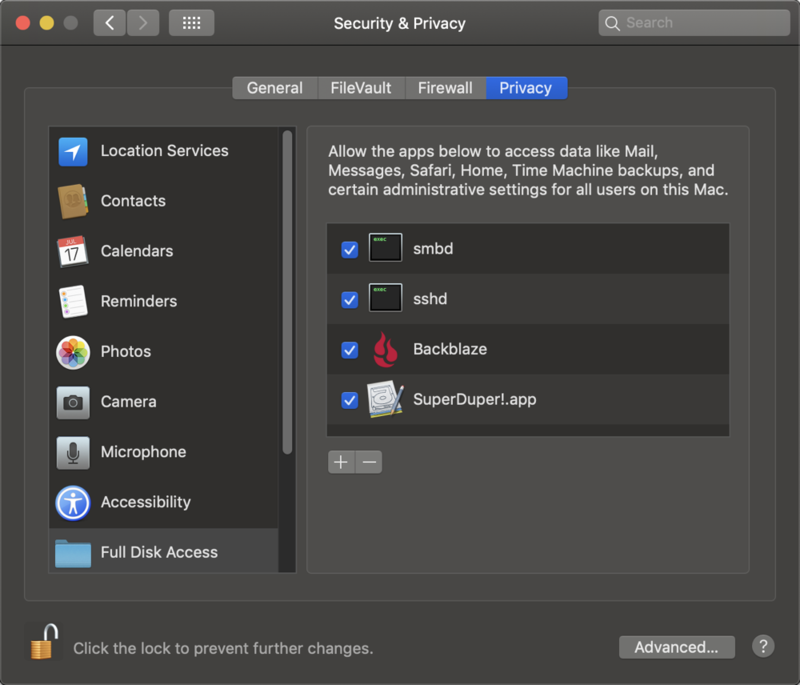 In System Preferences, Security & Privacy on the Privacy tab, you’ll now see an option called Full Disk Access. On installation of SuperDuper!, it opened this window and asked for permission to be granted, so all it took was a simple click of the lock and entering admin credentials and then checking the box next to SuperDuper!.app. I heard Dave Hamilton on the Mac Geek Gab say that Carbon Copy Cloner was also ready on day one of Mojave. CCC’s installation also walked you through how to give full disk access so it could run your backups. Sadly the folks at Backblaze were evidently asleep at the wheel and were not ready for this change when Mojave launched. When they realized the problem, they put out a blog post that outlined incredibly arcane instructions which if followed, would ensure all of your data was backed up. They specifically said that if you didn’t follow these instructions, your Photos would not be backed up. You had to right click on the application, choose Show Package Contents, drill down till you found a file called bzsrv, and then drag that file into the System Preference Full Disk Access section. Not exactly an ideal method. Workable for most NosillaCastaways, but daunting for some, I’m sure. I installed Backblaze as one of the first set of apps, but I didn’t do the Full Disk Access dance. I wanted to wait until my photos had all repopulated before switching that on. It didn’t occur to me that Backblaze would still start running backups without the Full Disk Access step. The way I discovered it was doing the backups was when I got a warning explaining that my 15-day trial was almost up. Of course, if I’d never logged in, Backblaze would never know that this was the same machine since I had done a nuke and pave. No problem, I’ll just enter my license key and be done with it. Turns out it’s not that easy. The tricky bit is you have to log in and inherit your old backup in order to inherit your license. Makes sense, why start a whole new backup? I logged into my account, did the two-factor authentication, told it to inherit my old backup and went on my merry way. The next day, Steve comes in and says, “Hey, Backblaze says someone else inherited my backup and now I can’t be backed up.” Well, it looks like I wasn’t as alert as I should have been. I went into Backblaze and discovered that I had, indeed, inherited Steve’s backup. Now I had my original backup, my trial backup, AND I had polluted Steve’s backup with all of my stuff. But even worse, when I tried to go back in and inherit the right backup, it didn’t work. The main problem was that I was no longer getting queried for the two-factor authentication. Ok, how about we try from Steve’s computer to steal his own backup back? Nope, no two-factor authentication prompt for him either. The good news is that Backblaze has live chat support, and my little friend Troy jumped in with both feet to help me. He was so responsive that I suspected he was only helping little old me. He assured me he was helping others too but they keep the numbers to a minimum so it feels like personalized service. He gave me instructions to uninstall and reinstall Backblaze as a starting point. But he said I should restart between the uninstall and reinstall. I was afraid to leave the chat, but he said they were going on lunch break from 12-1 anyway and if I ran into trouble I could jump into chat again at 1 and we’d keep going. I did run into problems so after lunch I tried to get into chat, and I was denied at 1, 1:30, 2, 2:30 and even 3 pm. I tweeted Backblaze and got the helpful response of, “are you still having problems?” They then suggested I email them back. I wrote an email and figured it would be best if I included my case number. I remembered that when my chat was complete with Troy before lunch, their Zendesk system automatically emailed me a transcript. I headed over to my mail to search for the email from Troy. And now finally you’re going to understand why I told you this long tech story as a setup for the listener review I’ve been about which I’ve been teasing you. When I searched for Troy in Mail.app, it found the transcript and the case number I was seeking. But it also found an email from someone named Troy Shimkus from January of this year. And that email had in it a recorded review. This was curious because the subject didn’t sound familiar to me. I started playing the recording and I was certain I’d never heard it. I hoped I was mistaken, so I did a search for Troy’s name on podfeet.com and even the subject of his review and it was not to be found. There’s one thing that makes this worse. According to the email exchange I uncovered, I had specifically asked Troy to make a recording for the show! This meant that a NosillaCastaway took time out of their day to record a fantastic review with great detail and great audio … and I completely ignored it. I had two choices, continue to be rude and discourteous and hide and hope I never ran across Troy again. Or I could throw myself on his mercy and beg forgiveness. Of course, I had to choose the beg for forgiveness path. The good news is that Troy took the high road, let me off the hook and told me not to be mad at myself. Now that, of course, made me feel even worse! He’s a champion of a human being, don’t you think? But it gets even better. Like I said, the audio is great. It’s not just high quality to listen to, the story is extremely well organized and thought out. I suspected he’d written up notes for this, so I asked him if he had the text for a blog post. I know, I left him in the lurch for nine months and now I’m asking even more of him! Well, this prince of a man immediately responded with the notes he’d written all those months ago and let me publish them as a blog post entitled Cord Cutting Solutions – by Troy Shimkus. In a way, I’m glad that I ran into trouble with Backblaze’s help desk because otherwise my search for one Troy wouldn’t have uncovered my egregious treatment of Mr. Shimkus and you wouldn’t have this marvelous review to which you can listen. Before I let Troy finally have the floor, I’ll finish the Backblaze story. The next day I tried again with the help desk at Backblaze and Troy jumped right on. He explained that they’ve been getting tons of calls since Mojave and their system is designed so they don’t have too many people chatting at once (hence my impression of one-on-one service.) I didn’t hold it against him, since he didn’t design it, and I only pouted for a little while. He had me pull a log file ( they have great documentation on their site on how to pull the file), and he said it looked like iStat Menus was somehow interrupting or blocking the handshake required to authenticate to their server to inherit the backup. He had me do some shenanigans including killing iStat Menus on my machine (which fixed the problem by the way) but when we did Steve’s Mac we only quit iStat Menus and Steve was able to get right into the server to inherit his backup. Very curious that iStat Menus was the root cause but it worked and I was happy. I have to say that fixing the problem with Backblaze wasn’t easy but Troy’s help was fantastic. The other good news is that Backblaze fixed the Full Disk Access problem and now it works just like the other backup apps. You do still have to grant Full Disk Access but it’s only a matter of saying yes, authenticating and checking a box. I’m still happy with \Backblaze and recommend it as my off-site backup tool of choice.